On June 15, 1938, Governor’s Executive Order No. 804 set aside 300.71 acres of land at Pulehunui for the new Maui Airport to be under the control and management of the Superintendent of Public Works. The Department of Public Works started construction on the new airport shortly after July 1, 1938. The airport was opened on June 30 1939. Development was continued by various agencies including the U.S. District Engineers under the Civil Aeronautics Administration Territorial Airport Program, then by a joint Army-Navy program. It was completed by the Navy. No appropriation was made by the 1939 Legislature for Territorial airports. Instead, the Legislature diverted $10,000 appropriated by the 1937 Legislature for a swimming tank at Kahului Fair Grounds to the Maui Airport. The funds were used to complete the grading of runways 1 and 2 to 3,000 feet long, 500 feet wide, and either graveled base or macadamized to a length of 3,000 feet. Inter-Island Airways, Ltd. constructed a depot at a cost of $6,000. A taxiway and turn-around were completed and graveled to serve the depot and in 1940 Inter-Island Airways spent $10,964 on airport station improvements. During the time between June 30, 1939 and December 7, 1941, the field was gradually enlarged and improved with some areas being paved. A small Naval Air Facility was established at the airport by the U.S. Navy. In 1941, the CAA constructed a radio range beacon and weather station at the airport. On October 6, 1941, Act 35, SLH 1941, appropriated $15,500 for Maui Airport improvements; and $6,000 for a Control Tower. On November 26, 1941, Governor’s Executive Order No. 959 transferred 14.77 acres of land to the USA for Maui Airport Military Reservation and the Army contributed $600 for construction work at the airport. On November 26, 1941, EO No. 963 withdrew 21.92 acres from EO No. 804 for the Navy Department for quarters and other facilities for the Navy personnel using Maui Airport. On December 5, 1941, EO No. 964 withdrew 21.92 acres from EO No. 804 for the Navy Department of the USA for quarters and other facilities for the Navy personnel using Maui Airport. The construction of the airport had been approximately 90 percent completed when the Army and Navy took over the airport on December 7, 1941 and consisted of two runways, each graded 4,500 feet by 500 feet and paved 4,500 feet by 200 feet. The armed services added greatly to the facilities of the airport, and as Naval Air Station Puunene, the airport served as a principal carrier plane training base. Immediately after December 7, 1941, the military took control of all air fields in the Territory and began the expansion of Maui Airport at Puunene. The demands of the war were such that the Navy found Puunene inadequate for the aircraft carrier training requirement and it was necessary to establish another large air station on Maui. Accordingly, a site was chosen near the town of Kahului and, after purchase of some 1,341 acres of cane land, construction was started in 1942 on what was to become Naval Air Station, Kahului. This facility later became known as Kahului Airport under the jurisdiction of the Hawaii Aeronautics Commission. NASKA became operational in late 1943. Air crews were trained at both Puunene and NASKA. After December 7, 1941, the northeast-southwest runway at Puunene was extended northerly to 6,000 feet graded 500 feet wide and paved 400 feet wide and the northwest-southeast runway was extended southerly to 7,000 feet graded 500 feet wide and paved 200 feet wide. A taxiway 7,000 feet long, connecting the two runways on the east side had been built. Water, sewers, electricity and telephone lines had been installed. Certain structures had also been erected. Interisland air service continued during World War II under strict military control at Puunene. On November 18, 1943, Governor’s EO No. 1037 transferred a portion of Puunene-Kihei Road (also known as Maui Airport Road) to become a portion of Maui Airport. In 1944 the Post War Planning Division of the Department of Public Works noted that the land covered by the wartime improvements had to be acquired by the Territory, otherwise the value of the improvements would be a total loss and Maui would have a third-class airport. A DPW report estimated that the land involved was approximately 255 acres and consisted of 160 acres of cane land valued at $500 an acre; 60 acres of potential cane land valued at $150 an acre; and 35 acres of pasture land at $25 per acre. They recommended that the 1945 Territorial Legislature appropriate $90,000 to acquire the land. The Planning Division also recommended that when the war was over that ground facilities be constructed to make the airport suitable to accommodate four-engine airplanes for Trans-Pacific flights. This was estimated to cost $50,000 which would be covered by CAA funds. Act 85, SLH 1945, appropriated $75,000 for the expansion of Maui Airport, including acquisition of lands or interests therein. Governor’s EO No. 1134 dated January 25, 1946 transferred 251 additional acres to Maui Airport. October 1, 1946 marked the entrance of the Territory into full-scale commercial operation of airports. Puunene Airport was taken over under a permissive agreement with the Navy. In December 1948 the Navy declared the land surplus to their needs and the airport reverted to the Territory under Quitclaim Deed from the U.S. Government. A program to dispose of surplus buildings and materials was launched. The airport consisted of 515.639 acres. Ownership of the land was spread with the Territory of Hawaii, Army, Navy and Hawaiian Commercial and Sugar Company. No major improvements were made to Puunene Airport as the HAC planned to move commercial operations to the former Naval Air Station at Kahului, which was considered much more desirable for commercial airline operation. The Federal Government reported spending more than $11 million on Puunene Airport from 1938 through World War II, while the Territory of Hawaii contributed $44,079 between 1938 and December 7, 1941. Many of the facilities constructed, although necessary to the war effort, had no utility in commercial airport operations. The Superintendent of Public Works recommended improvements including an administration and terminal building, fencing (to take the place of Naval control), completion of lighting facilities, a seal coat application for all paved areas, drainage improvements, minor additions to taxiways and turn-around areas, and general clean up to remove revetments and perfect visibility. The improvements were needed to comply with CAA standards. The basic airport construction was good but in certain respects the exigencies of wartime construction necessitated various shortcuts that need to be corrected. 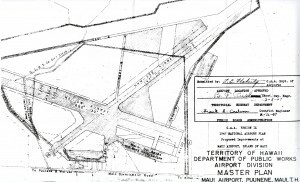 The DPW prepared a Master Plan for Maui Airport in October 1946 and the improvements requested by the DPW were approved by the CAA Region IX in the 1947 National Airport Plan. As early as 1947, the HAC planned to move all operations from Puunene to Kahului. In December 1947, the Navy turned over jurisdiction of Kahului Airport to the Territory and the HAC assumed control on a custodial basis pending formal transfer. Act 32 of the 1947 Legislature, placed Maui Airport (Puunene) under the management of the newly created Hawaii Aeronautics Commission effective July 1, 1947. On May 25, 1948 the HAC decided to accept the buildings and improvements at Maui Airport under Public Law 289 and to continue operation of this airport, all while planning to move commercial operations to Kahului. The Territory of Hawaii and War Assets Administration executed Quitclaim Deeds on December 31, 1948 returning Maui Airport to the Territory of Hawaii. At the same time, by means of another Quitclaim Deed, lands acquired by the Navy under condemnation proceedings were transferred to the Territory. The airport consisted of 515.639 acres of land and two paved runways 400 feet in width and 6,900 feet in length. In addition, another parcel comprising 50.17 acres of Navy owned land adjacent to the airport and improvements was deeded to the Territory. Each airline had its own terminal facilities. Governor’s Executive Order No. 1321 dated April 6, 1949 withdrew 214.77 acres of land from the operation of Maui Airport Military Reservation as the Army had declared the land surplus to its needs. EO No. 1322 withdrew 21.92 acres of land from the operation of the Maui Airport Military Reservation as the Navy had declared the land surplus to its needs. The HAC approved the expenditure of $2,000 to improve terminal facilities to be occupied by Trans-Pacific Airlines on May 3, 1949. The Commission approved on February 19, 1950 that certain parcels of land obtained under Quitclaim Deed at Puunene Airport be utilized to develop farm lots for the unemployed under lease arrangement for the purpose of deriving revenue for the Commission. Lots were laid out at the southeast end of Puunene Airport for use as piggeries. On July 24, 1950, rental rates were set at $50 per acre plus water. This was rescinded to $4 per acre per month on December 28, 1950. By June 1950, Maui Airport was still the principal airport on the Island of Maui and was served by all scheduled and non-scheduled operators. It was equipped with lighting facilities for night operations and was a designated International-Alternate for most of the overseas operations. There were two paved runways 400 feet wide and 6,900 feet and 6,000 feet in length, respectively. In 1950 a crash and rescue crew was formed with personnel of Hawaiian Airlines and Trans-Pacific participating. During periods of actual drill or fire fighting, these men were under contract to the Aeronautics Commission. Drills were held on the average of once a month and a fair degree of efficiency was obtained. “We are glad to report that since December 1949 when the crew came into being, they have not been called to serve at any crashes or airplane fires but have assisted in extinguishing several grass fires at the airport,” the HAC reported. Two fire trucks were obtained from the U.S. Navy for this purpose. Additional equipment such as protective clothing, fog nozzles, etc. was purchased by the Aeronautics Commission. An intensive program of using surplus property to the best advantage was inaugurated. All property, buildings and equipment necessary for proper operation of a civilian airport were segregated and reserved for the use of the Aeronautics Commission. With Civil Aeronautics Administration’s approval all non-essential property was gradually being disposed of though sales to the general public. Some buildings were razed, the lumber and materials stockpiled and sold at pre-arranged prices. Since such materials were scarce on Maui, the program was of benefit to the bidder who had to raze the building and remove it from the premises at his own expense. The Maui AJA Veterans Club occupied the gymnasium and swimming pool area and two buildings were turned over to the Civil Air Patrol for their use. Items of much needed equipment were loaned to other Territorial departments who were unable to obtain them from other sources. The program was a great benefit to the community as a whole. The HAC authorized $25,000 for repairs to Puunene Airport on July 24, 1950, and on October 23, 1950 the HAC requested that the Maui Electric Company take over the electric system at Maui Airport effective November 1, 1950. On April 23, 1951 the HAC met with the Maui Waterworks Board to discuss their request for several miles of certain pipeline installations at Puunene Airport which were serving no particular purpose. The Board also asked if it would be possible for the waterworks system at Puunene to be turned over to the County of Maui. It was pointed out that CAA approval would be needed. The HAC decided to decide first on the disposition of certain land on the airport in order to definitely determine how the land would be utilized in the future. The HAC officially made the decision to move interisland air operations from Puunene to Kahului on May 25, 1951. An interesting item of cargo came about in 1951 through assignment of the Maui County Maintenance Crew to construct an air freight terminal at the Kona Airport, island of Hawaii. After study it was found that savings in shipping costs could be made through utilization of air freight. Materials for this project were provided by dismantling a surplus building at Puunene Airport and flying it to Kona at less cost and greater convenience than surface transportation. Increased activity in air freight necessitated night flights and increased facilities for both Trans-Air Hawaii and Hawaiian Airlines. Needed lighting facilities and additional freight terminal space were provided for both airlines. A program of remodeling and modernization of Trans-Pacific Airlines passenger terminal was completed in June 1951. 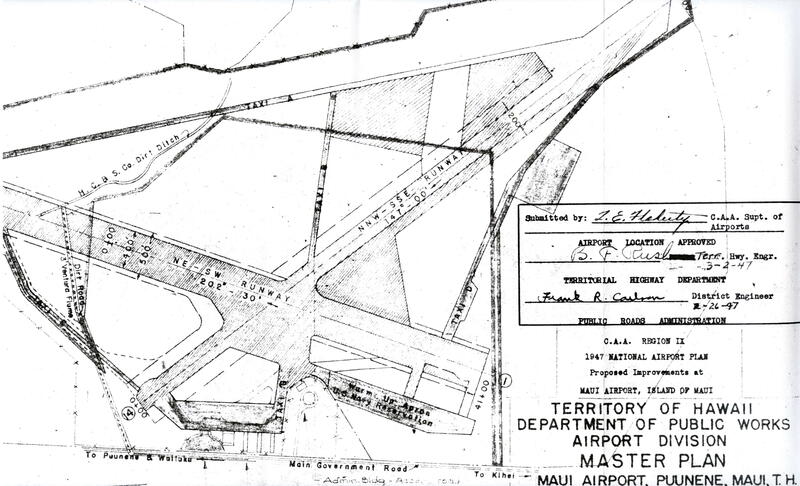 The HAC was reminded by the Superintendent of Public Works on October 22, 1951 that the original idea was to build a $15,000 temporary terminal at Maui and this sum had been allocated. Subsequently the terminal changed, without authorization, to a permanent structure. Money was spent without authorization and there was no alternative but for the Commission to approve whatever sum had been expended. The Commission voted to continue the work until October 31. The HAC approved the Maui County Waterworks Board’s request for the use of the HAC’s 500,000 gallon reservoir and water lines at Puunene on March 13, 1952; in return they would supply water service to the airport area, metering each individual user. On June 24, 1952 all airport operations and facilities were transferred from Puunene Airport to Kahului Airport. The Maui Airport at Puunene was placed in caretaker status on June 30, 1953. The Maui Land Development Committee of the Economic Planning and Coordination Authority requested that the HAC declare seven parcels of land and improvements at Puunene Airport surplus to its needs, upon receipt of title at Kahului Airport. The HAC granted the request on November 19, 1955. Maui Airport was closed to aeronautical activity on December 31, 1955. The HAC approved closing runways at Puunene Airport for drag races and time trials in May 1956, provided that it would meet with the approval of the CAA and not jeopardize the HAC’s interest in Puunene Airport; and that insurance be worked out so that the HAC would not incur any liability. The HAC was advised by the local CAA office on July 30, 1958 that the CAA in Washington, D.C. had released Maui (Puunene) Airport. Release of this airport, which has been closed since December 1955, permitted the Commission to sell the land and use the proceeds for aeronautical purposes. A release from the Federal government, releasing the Territory from the covenants and restrictions contained in the Quitclaim Deeds returning Maui (Puunene) Airport, was accepted in September 1958. The HAC was then permitted to sell the land and improvements on this former principal airport. Money derived from the sale was to be used for airport purposes, including the construction of a new terminal building for Kahului Airport. Governor’s Executive Order No. 2384 dated June 4, 1968 cancelled EO Nos. 804 and 1134 as lands were no longer needed for aviation purposes.